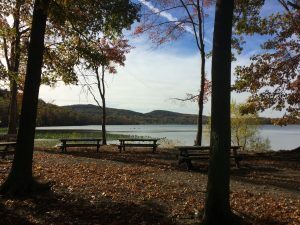 I was out of the city this weekend for mom’s birthday and was looking forward to a long run. 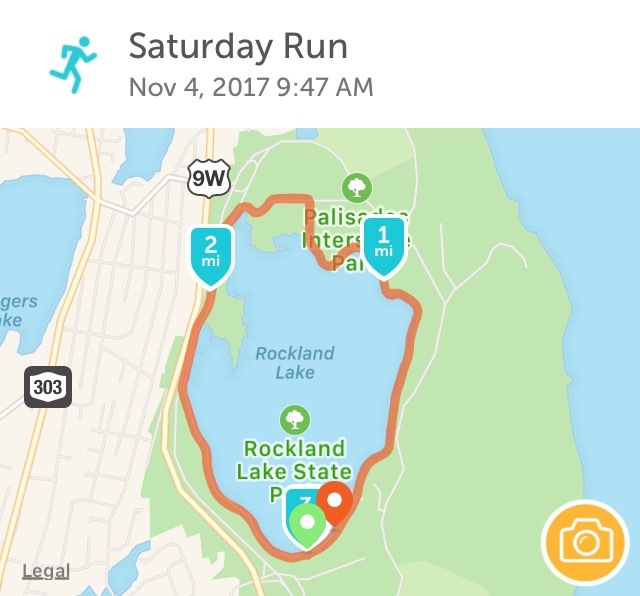 I knew I didn’t want to do endless laps on the course near mom and so when the morning dawned absolutely gorgeous I negotiated the car and headed for Rockland Lake State Park, a place I’ve always enjoyed. The GPS was a little drunk as I promise I was neither walking on water nor water skiing at the north end, but it really is a gorgeous place to spend a fall day. I wasn’t sure exactly how long the Lake lap was, but knew it was around three miles and would be a good course. 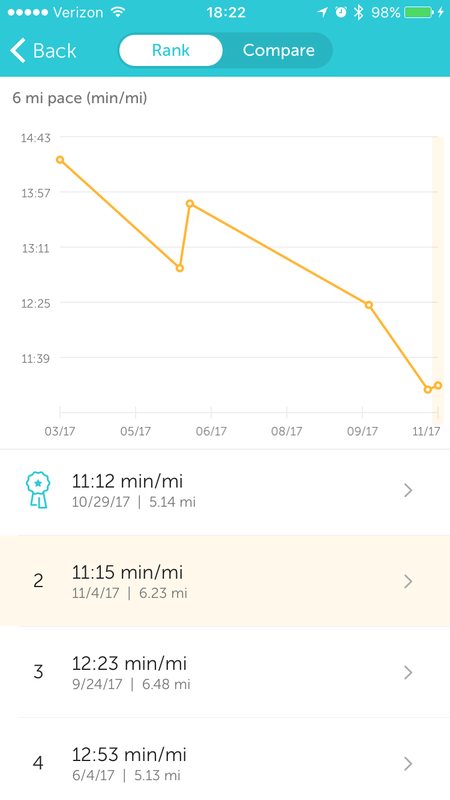 Turns out it was almost exactly three miles according to my watch when I closed the first lap. My hip was aching a little, but it wasn’t pain and I was otherwise feeling good so I kept on. I had water with me, but wasn’t thirsty and didn’t feel ready for my Gu. I carried it with me last weekend but never ended up eating it as I wasn’t sure how it would feel with my stomach and the idea of trying to fiddle with it in the rain wasn’t appealing. So I went for lap two. For the first time in possibly forever, the first three miles felt like the warmup that people always say it is. 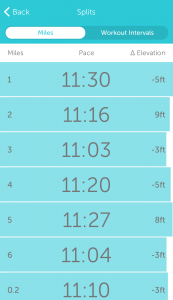 Those are some ridiculously consistent splits. I know why six was quick, but not sure why three was almost identical. Weird quirk or watch issue? I was wearing long sleeves and only looked at the watch when it buzzed on the mile, which really works for me. 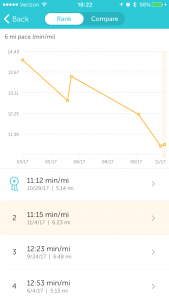 I like the data, but running and reading don’t go well together for me. As the second lap continued I contemplated water, Gu and stretching and knew I was good to keep going until the end. 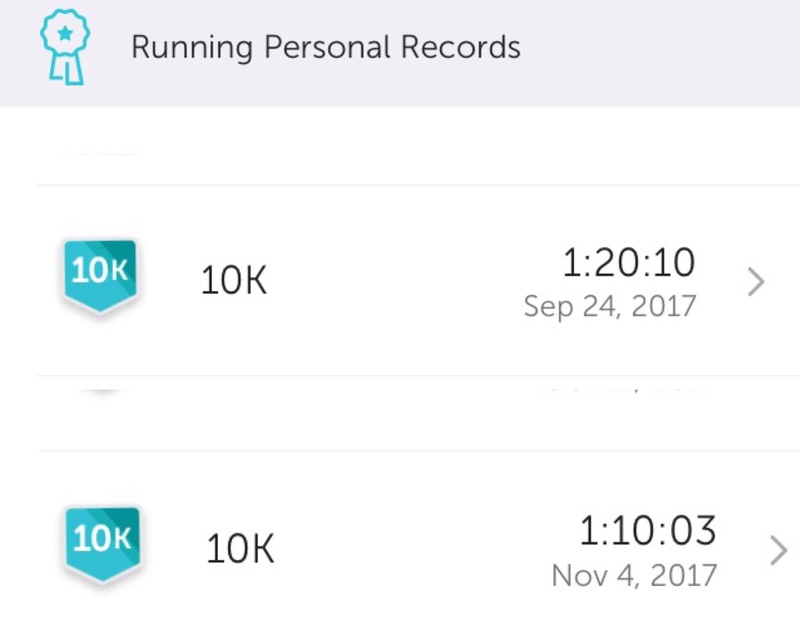 I had a thought of a PR, but what I really had a thought of was my first ever six mile run without a walk or stretch break. It helped that the course is absolutely pancake flat, but what also helped was no recurrence of last Tuesday‘s breathing issues despite it being cool again. Being near water probably helped, but I’m keeping my fingers crossed it was a one off. So what did a no break 10K add up to? 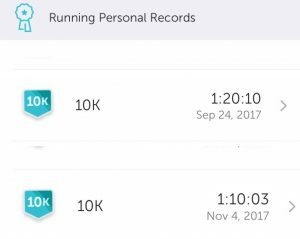 A hulk smash PR of ten minutes after September 24 marked a six minute PR. Hello training and a consistent base. Of course, the weather is also a factor, but it’s not a ten minute factor. The weather was probably comparable to March and well, that would mean a 22m PR due to training/improvement without the weather factor. I’m floored. 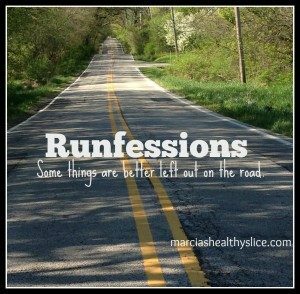 24 hour runners’ high. Despite a PR, not my fastest pace at distance because of how Runkeeper tracks them, but I don’t care. I’ve said before that in addition to preferring 4-6 miles over 5K, I really prefer five miles to six. That last 1.2 just feels like forever. 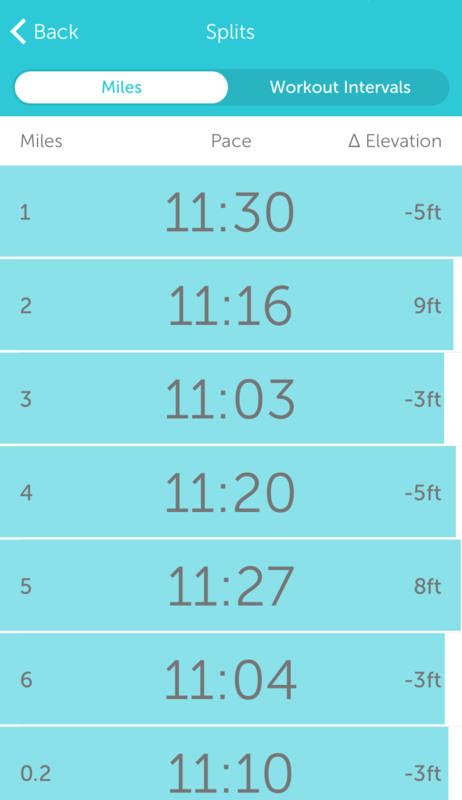 The fact that I was quicker in mile six than five and consistent with last week’s five mile makes me happy. My hip almost didn’t hurt after the second lap, but I gave it a good stretch before driving back (this whole driving to a workout thing-so weird!) and it has been fine. As I walked back to the start from where the last .23 ended I tore into the Gu to give it a try. Stomach wise, it was absolutely fine. Taste? A little too rich even with water. As much as I like that flavor in general, I think I’ll pass on it going forward. I still have ginger and vanilla orange to try. Nice two+ miles today because I couldn’t let marathon Sunday go with no activity and I wanted a shot at my Fitbit goal. Humid, no breathing issues. Weird time, but wasn’t running for time and stopped as I ran into people I knew. I’ll take tomorrow off running so as not to push it, but felt good to be able to do two days in a row. 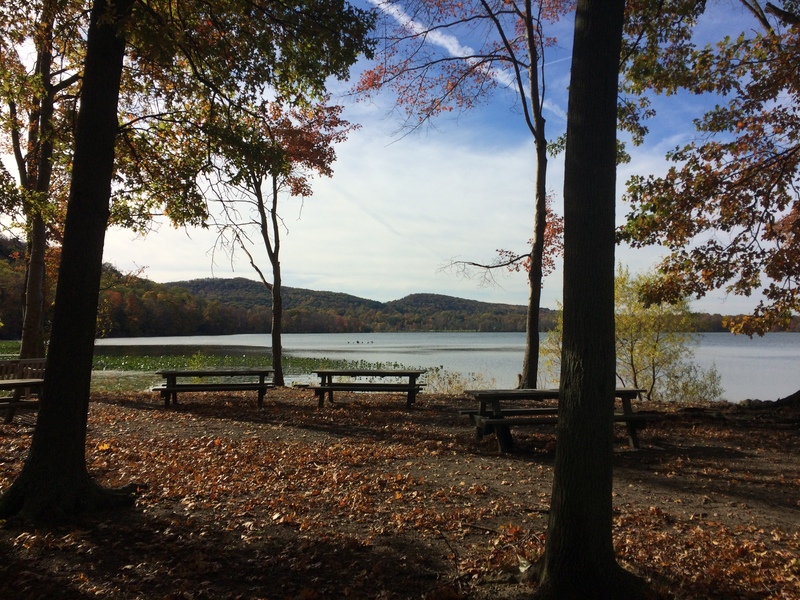 I look forward to running Rockland Lake again for the Turkey Trot. Looking forward to running on my birthday and waking at oh’dark’thirty to do so. Who AM I? I mentioned this when Mary Keitany won the Mini 10K in which I ran in June, but there’s something about the elites running on the very same course. That hit home as I was watching the women leaders in this morning’s marathon. As Shalane Flanagan took her commanding lead this morning it was just weird to see her running on a course I run at least weekly. So awesome and amazing. We’ve been lucky to see she and Meb in the last decade. 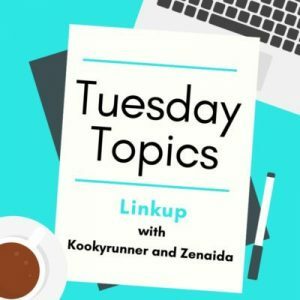 Looking forward to catching up on the blogs of some folks I knew who ran. Besides being ugly, the Poland Spring 5M shirt doesn’t even fit. It’s relegated to mom’s as a backup if I want to run and forget clothes. Fabulous work – very well done!! And the feeling of running in the elites’ footsteps is amazing. The Birmingham Half Marathon was the World Champs one year I ran it and I got to run (a long way) behind Haile Gebresellassie! How cool is that! Have my first winter run of the season coming on Saturday. High forecasted to be ~40F/10C. Oddly looking forward to the challenge. Ah, cool. I remember him on the telly complaining about the terrible spiral hill at the end and we were all like yeah, we can complain about that if he can!